5. Spoon the mixture into the lined cake tin. Smooth the top with a spatula. Bake for 2 hours 45 minutes – 3 hours, rotating halfway through the cooking time to ensure an even bake, and covering it with foil if it looks too dark. Test to see if the cake is baked by inserting a skewer into the centre. A few crumbs should stick to it, but no raw mixture should be present. 7. To make the cinnamon spiced cake, preheat the oven to 170oC, gas mark 3 and grease a few holes of a mini muffin tin with butter and line a 11cm loose-based sandwich tin with baking parchment. 8. In the bowl of a stand mixer, combine the flour, sugar, butter, baking powder and cinnamon using the paddle attachment. Mix on a low speed until the mixture resembles fine breadcrumbs. You shouldn’t see any large lumps of butter. You could use your fingers to rub the butter into the flour and sugar if you don’t have a stand mixer. 9. In a small jug, use a fork to blend the egg, milk and vanilla bean paste together. Add the mixture a little at a time into the bowl, beating until it is all combined. Keep beating for a few minutes more, until the mixture is uniform and smooth with no lumps. Pour the mixture into the sandwich tin and fill two or three holes in the muffin tray with a spoonful of mixture. 10. Bake the 11cm cake for 20 minutes or until risen and golden, and bake the muffins for 15 minutes. Remove from the oven and allow to cool completely. 11. Make the buttercream by beating the butter, gradually beating in the icing sugar with an electric whisk until it is light and fluffy. Lightly cover the 11cm cake and muffins with the buttercream and chill until needed. 12. Warm the apricot jam, then brush over the fruit cake. Roll out the marzipan on a surface dusted with icing sugar and cut a circle large enough to cover the cake. Place on top of the cake and smooth the marzipan down, then trim away any excess. Roll out ¾ of the white fondant and repeat the process above, brushing the marzipan with jam. 13. Roll out the remaining fondant and use to cover the 11cm cake. Roll out some black fondant and cover the muffin to look like a top hat. 14. 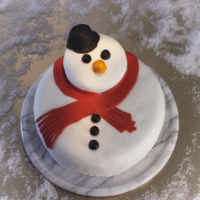 Use the remaining coloured fondant to create eyes, buttons, a red scarf and an orange carrot nose for the snowman, applying them to the cake using a small amount of water or left over jam.